Yorkshire-based Cooper King Distillery has launched its inaugural gin expression – Cooper King Dry Gin. The self-built distillery’s first expression is made using honey from on-site beehives as well as lemongrass and locally grown lavender. 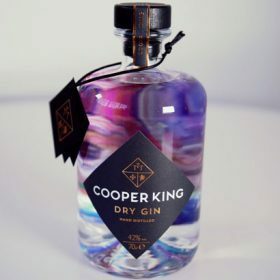 Cooper King Dry Gin uses a combination of cold vacuum distillation and traditional hot copper-pot distillation, giving it a “silky mouthfeel” with “delicate floral notes” on the palate. Bottled at 42% abv, the inaugural expression from Cooper King Distillery carries a recommended retail price of £39 (US$51). The company has also announced that it is the first distillery in Europe to join international environment initiative, 1% for the Planet, which sees 1% of its sales contributed towards environmental non-profits. When it launched, Cooper King Distillery also announced that it would plant one square metre of native woodland for every bottle sold through a partnership with the Yorkshire Dales Millennium Trust. The distillery, which is based in Sutton-on-the-Forest in North Yorkshire on the site of a former horses’ stable, was founded by Abbie Neilson and her fiancé Chris Jaume. SB recently published its annual Brand Champion supplement, which tracked the sales of the world’s biggest selling gin brands.